…the celebration of Candlemas — or Imbolc — is an extremely close second! For those of us who are unfamiliar with this holiday, allow me to provide you a super quick rundown. Candlemas~Imbolc occurs in the Northern Hemisphere generally between the days of February 1-3. It is the celebration period between the Winter Solstice and the Spring Equinox, traditionally coveted as winter’s “halfway point.” It is also the day we commonly know as Groundhog Day. This year Candlemas~Imbolc fell on February 2 — and if I was a disciplined blogger I would have prepared a little piece to be published a couple days ago…oh well, maybe next year (however, it’s not to late to embrace the magic of the season). Candlemas~Imbolc literally means “in the belly.” It’s a time to prepare ourselves for the coming season of growth + warmth. It’s a time for cleansing and purification. It’s the perfect time to release the past…to set new goals, plan new projects, and brainstorm new ideas. I spent time yesterday celebrating this joyous day by planning my garden, planting a few (okay…maybe more than a few) veggie transplants, and ordering some seeds. I also enjoyed a relaxing evening lit by a multitude of candles. …and I attribute that feeling to this year’s alignment of Candlemas~Imbolc with that of the Full Moon. 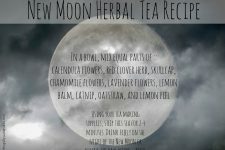 On that note, let’s transition to the Moon and the benefits of herbal tea. When we begin to understand the humanity + nature connection, and realign our lives — living in harmony — with the lunar cycles, patience and purpose becomes the norm. During the time of the Full Moon (which I observe for a three day period — the day before, the day of, and the day after), the intentions/plans/goals set forth at the beginning of the lunar cycle (during the time of the New Moon) are actualized. It’s the perfect time to harvest herbs that will be used with healing intentions. 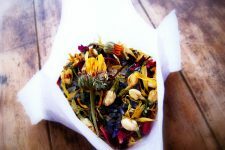 The medicinal benefits of botanicals gathered by the light of the Full Moon are unmatched! Additionally, it’s a wonderful time for a juice fast or cleanse. 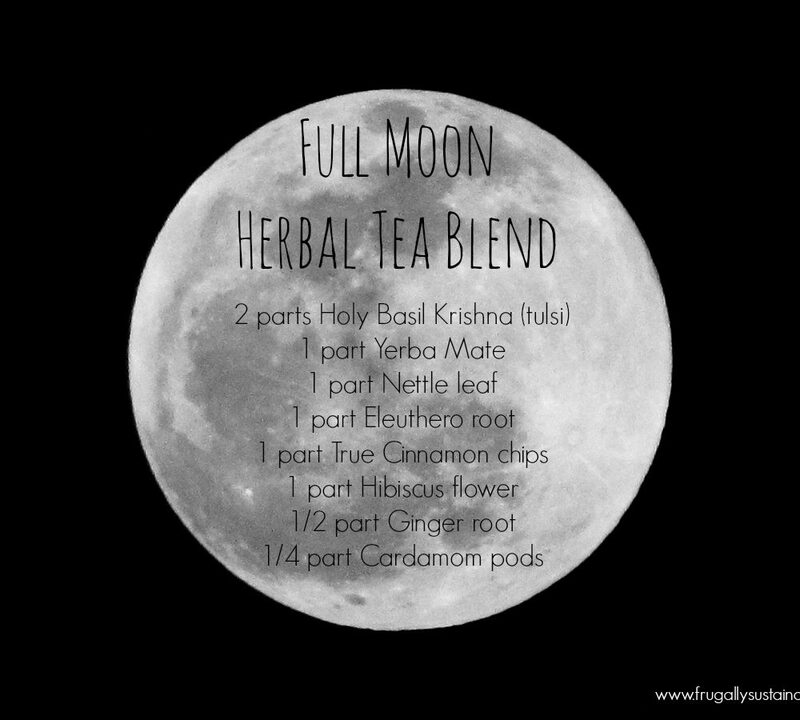 One of the ways I honor the power of the Full Moon + my body, is with the consumption of a plant infusion. 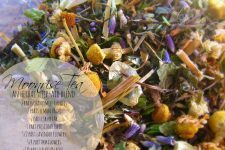 For the recipe, I combine nourishing + adaptogenic herbs that provide the necessary support for my thyroid and adrenal glands. 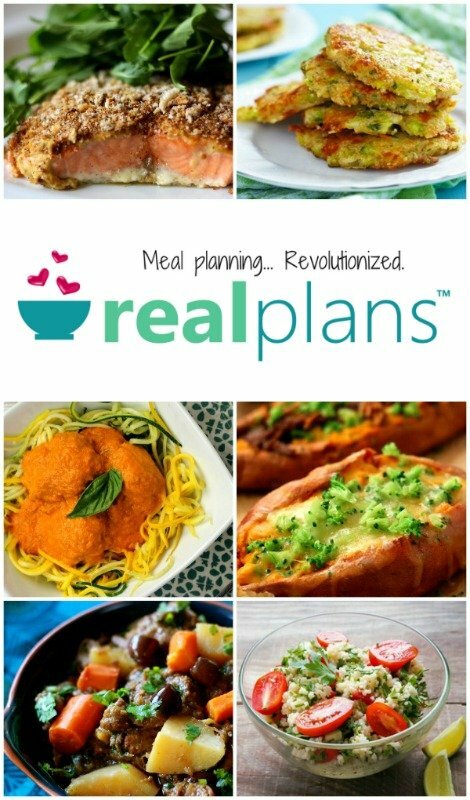 Ingredients*Purchase organically-grown or wild-harvested herbs whenever possible. Andrea, I so love your posts! Imbolc is also my favorite turn of the seasons! The tradition that my Mom and I practiced was based more on the Earth Seasons: Imbolc, Beltane, Lughnassa, Samhain, which were considered feminine in nature, whereas the Solar Seasons (Vernal and Autumnal Equinoxes, Mid-Summer/Summer Solstice, Mid-Winter/Winter Solstice) were considered masculine in nature. The Solar Seasons were based on the sun and its relationship to Earth at those times. The Earth Seasons were based on what was happening within Earth and how that manifested into life. We always loved Imbolc because, in the Earth traditions, it was considered the beginning/start of Spring, not the Vernal Equinox which was actually mid-Spring. This tradition is much older than the observance of only the Solar Seasons. This is why Summer Solstice is referred to as Mid-Summer and Winter Solstice is referred to as Mid-Winter. Although our patriarchal driven society, which is what our calendars are based on, continues to state that Summer Solstice is the first day of summer and Winter Solstice is the first day of winter, these have never reflected the ‘True’ seasons of Earth. With the accelerated abuse Earth has endured in the past century, all the seasons are shifting, trying to find balance. But I still look forward to Imbolc and its promise of Spring! Ruth! Thank you so much for sharing your wisdom and insight with me! WOW! I TOTALLY relate and understand what you are saying here. Many, many blessings. Thank you again!